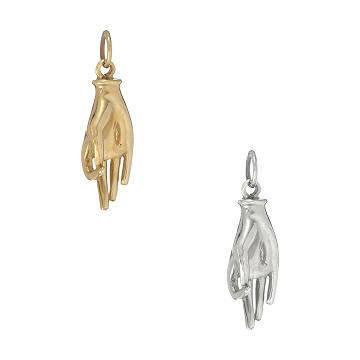 Casey Benjamin’s inspirational charm depicts a hand gesture made by the Buddha, representing compassion. Two-time cancer survivor Casey Benjamin believes that the jewelry you wear every day can bring "good juju" into your world. Like this charm depicting the mudra, a hand gesture made by the Buddha. Buddhist teachings say that mudras can shift energy and help you find your path to awareness. They're also symbols of empathy and compassion.